Just a quick post to provide information on traveling between Oaxaca and Puerto Escondido by bus. The best option we found is a minibus service operated by a company called Servicio Express. In Oaxaca, they are located at Arista 116 in the centro. You can buy your tickets a day ahead and choose your seats. The trip to Puerto cost 130 pesos, and takes about six hours, depending on your driver. There are a lot of swtichbacks, so it is a bit of a wild ride. If you are prone to car sickness it might be a problem, but we had no trouble. You get dropped off in the center of Puerto in front of the Hotel Luz del Angel. Note the location, as it is the place the bus leaves from to return to Oaxaca. The hotel is on the corner of 1 Norte and Av. Oaxaca. If you are staying in the Zicatela beach area, it is a quick inexpensive cab trip to get there. You can buy tickets back to Oaxaca from the travel agency on the Zicatela strip. They charge an extra 20 pesos per ticket commission, but it saves having to trek up to the centro to get tickets. There is also a first class bus that goes between Oaxaca and Puerto, but it takes something like 10 hours, so we really didn't consider it. Thanks so much for the info on Servicio Express. 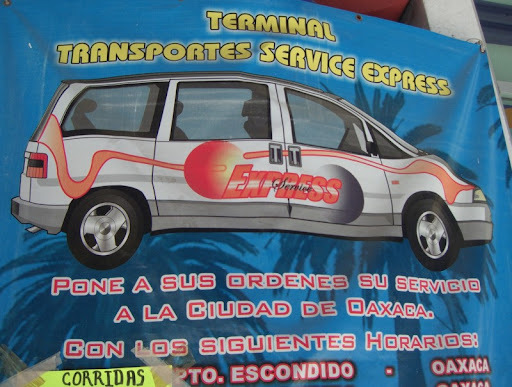 My boyfriend and I were in Oaxaca City just last month and chose to take Servicio Express instead of the first class bus service. We arrived in Escondido in 6 hrs. and for half the price of a first class bus! The van dropped us off just outside the Hotel de la Luz. Then we immediately found a cab that took us to Zicatela for 25 pesos. Servicio Express was overall pretty comfortable and convenient. Thank again! Hi Maria - glad to hear that the info was helpful (and still up to date). been surfing now for a while to find an alternative to the long hours of the bus services. Hi, do you have any contact info for Servicio Express? I'm traveling with a group, and we want to try to get our tickets in advance if possible. Thanks! I'd like to take the van from Oaxaca to Puerto Escondido, but have a second bag with scuba gear. Would that be a problem ? I would check first - the baggage situation in the van was pretty cramped. Hi Guys, I wondered if anyone knew what time the shuttle service left in the day? I can't remember the exact time, but it was definitely relatively early in the morning. Yes, I'm pretty sure you can go just one way. Does anyone know if these busses run through the night? I am landing at 11pm in Oaxaca and would like to make it to Puerto by the morning.